Welcome home, Insiders! My poor record as the LAKI was well-documented but thankfully morning skate attendance doesn’t count. The Kings were back on the ice at Toyota Sports Center, prior to hosting Winnipeg later tonight. Kings Vitals: Jonathan Quick left the ice first for the Kings and is projected to start in goal tonight. All time, Quick is 4-5-2 in 12 appearances against Winnipeg, with a 3.02 goals against average and a .888 save percentage. The Jets are the only team Quick has a GAA above three against and his save percentage is tied for his lowest against any individual opponent. Defenseman Paul LaDue was the lone extra this morning as a skater, working alongside forwards Kyle Clifford and Ilya Kovalchuk (red jerseys) and goaltenders Cal Petersen and Jack Campbell, who is expected to be available again after the Christmas break. Jets Vitals: The Jets are skating this morning at STAPLES Center – Per Mitchell Clinton of JetsTV, Connor Hellebucyk is projected to start in net for the visitors this evening. Also per Mitchell, the “same lineup” would look something like this for the Jets, who have won three straight games in overtime, five straight games overall, five straight road games and nine of their last ten overall. #NHLJets coach Paul Maurice said the Jets will go with the same line-up as against the Lightning. Hellebuyck starts in goal, but Maurice plans to get Brossoit into a game on this road trip. 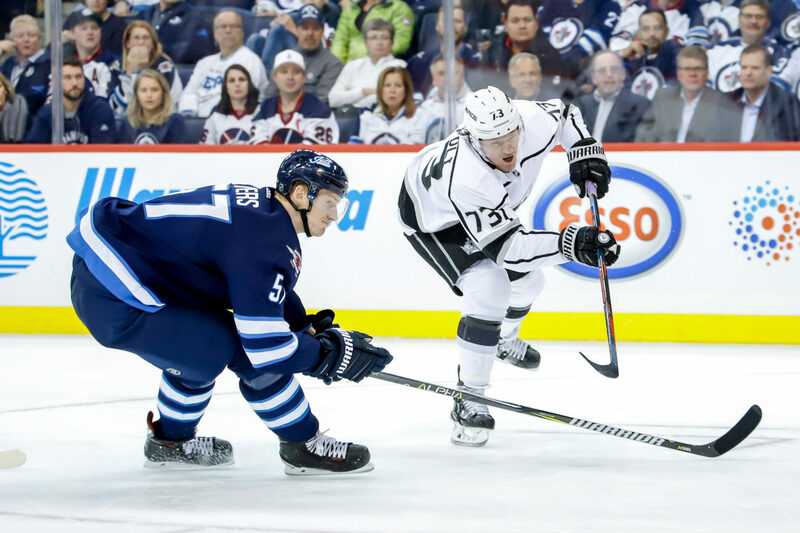 Notes & Updates: Outside of the top line, the Kings have made some adjustments to the rest of their forward corps, with combinations that were used in stretches in Saturday’s overtime loss against Pittsburgh. Kings Head Coach Willie Desjardins put Jeff Carter with Adrian Kempe and Tyler Toffoli at the end of Saturday’s game and kept that trio together this morning, with Kempe moving to the left wing and Carter in the middle. Desjardins noted that it will be a bit harder to Kempe to play on the wing as opposed to in the middle, since he believes the Swede is a “bit more of a natural center”, however he added that when you have three good players, they find a way to play together. For his part, Kempe noted that there are differences between playing on the wing and playing in the middle of the ice, but with he and Carter, they are able to switch on and off at times as well between the middle and the left side. For a player that thrives off of playing with speed and skill, Kempe’s move to the left does take his playmaking ability out of the middle of the ice and pushes him further away from his goal, but Kempe believes he can still use his speed to thrive, it’s just a matter of using it differently and in different situations. The other big shake-up this morning was the “kid line” of Wagner – Amadio – Luff remaining together after a strong effort against the Penguins. Desjardins felt that line was “outstanding” on Saturday and they remained as a unit this morning. The three players did play together for a few games last season in Ontario for a few games before Matt Moulson joined the team – and played together for one game this season as well, as Luff chimed in – but hadn’t seen much time as a trio at the NHL level. Saturday saw a significant uptick in ice time for Amadio especially, who cracked the 13-minute mark for just the second time in his last 16 games played with the Kings. Outside of the Kopitar line and Nate Thompson, no Kings forward logged more ice time at even strength on Saturday than Amadio. As a whole, the increase in chances for Amadio, both as a scorer and as a creator, has been noticeable for those that followed the recent four-game swing. Amadio recorded a shot on goal in each of his last four games, after going without one in eight of his prior 11 games. Keeping the trio together tonight could provide all three players with an opportunity to showcase their abilities once again. I think he’s playing great. I think he’s done a lot of things, just as much in the room as on the ice. That’s always a tough one, trying to do too much. I think sometimes you need to stay within your structure a little bit, but all-in-all, you’d way rather have a guy that’s trying to do too much to make things happen than a guy that doesn’t care, so I have no problem, he’s been great for us. He’s got another test to go, so once the test is done we’ll have a good idea. That should happen today or tomorrow. Well, the next game is part of their skill development. I think if you’re going to have good players, you have to play to win. I think, if you just let guys play and the outcome doesn’t matter, then you really don’t develop a player anyways. I think it’s important that we’re developing to win and I think they have to play that way. They need to keep their skills, and we’ll do that during practice, we’ll work on that, but when it comes time for games, they have to be intense and they have to play hard. I think he’s a good player and that line probably got him excited again, gave him a little different look. He wants to contribute, he’s a great guy and for me, I’ve got to find a way to get him going again and that one way is to find a way with those two guys [Kempe and Toffoli]. I think we still want to prove a lot of stuff. Obviously we played together last year, especially when Carts was out, so we know each other pretty well. We’ve been together lately now and we’re still looking to improve a little bit, but I mean, I think we’ve stepped up our games since the start of the year. We just want to keep building on that and keep creating chances, then it’s just a matter of time. When you don’t create anything, that’s when you get a lot of frustration and stuff. It’s tough when you don’t score, but if you still create, it’s like a different frustration in a better way at least. You’re playing well, so it’s just a matter of time. I think we’ve been playing better and better lately, so hopefully we can keep that going tonight.